Sails Every day (Thursday Adult Only) 10:00-15:00. Adult Price €59 : Child Price (2-12) €35. Pick up is included from all resorts in the South of Gran Canaria. The boat is 26 metres long and 9 metres wide and you can freely move around the upper and lower decks as you wish. On the top deck is the lounging area and there are enough sunbeds for each person to relax and enjoy the sunshine. The lower deck has a fully stocked Bar and ample lounging areas, ideal for you to cool off and get some shade. Children are permitted, although the boat appeals mainly to adults and is purpose built to suit them. Thursdays are adult only. Wonderful buffet lunch, freshly prepared for you. This includes Tropical Salad, Tuna Salad, Marinated Chicken, Steak with Sauce and potatoes. There is an all-inclusive bar during the trip, where you can get San Miguel Beer, Premium Top Shelf drinks, Sangria (prepared on board) and soft drinks. Once everyone is comfortable, we begin our glorious journey along the coast, heading towards El Descojonado Point where we have a swim stop. The wonderful thing about this trip, is the présense of four completely different elements which make Gran Canaria so wonderful. 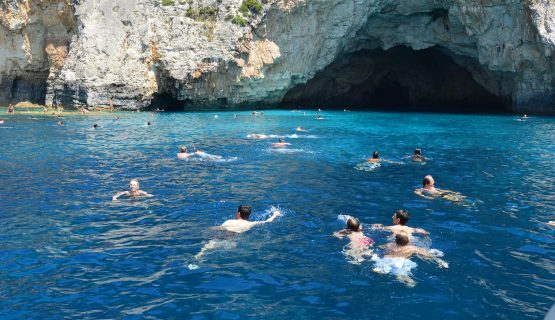 Expect to see enormous valleys, jagged lave cliffs, beaches and marine caves. On a very clear day, you may be lucky enough to see Mount Teide, which is the highest peak of Spain and located on the neighbouring Island of Tenerife. 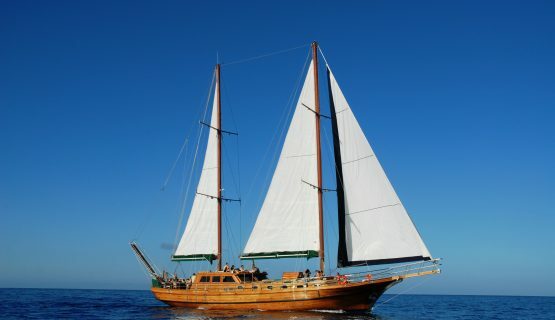 Step on-board the ultimate sailing experience in Gran Canaria on this stunning Turkish Gulet. Just chill and take in the amazing scenery of the southern and west coast of Gran Canaria. The Aphrodite is a stunning Turkish Gulet and is the perfect day out for those who like a bit of luxury . 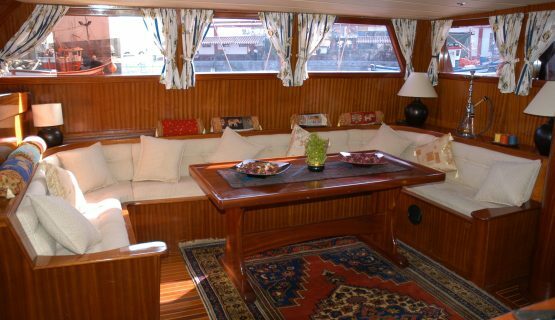 The boat is 26 metres long and 9 metres wide and you can freely move around the upper and lower decks as you wish. On the top deck is the lounging area and there are enough sunbeds for each person to relax and enjoy the sunshine. The lower deck has a fully stocked Bar and ample lounging areas, ideal for you to cool off and get some shade. We pick up in the resorts in the South of the Island and sail from Puerto Rico Harbour. Once on board, you will receive a welcome glass of champagne. There is an all-inclusive bar during the trip, where you can get San Miguel Beer, Premium Top Shelf drinks, Sangria (prepared on board) and soft drinks. Once everyone is comfortable, we begin our glorious journey along the coast, heading towards El Descojonado Point. The wonderful thing about this trip, is the présense of four completely different elements which make Gran Canaria so wonderful. Expect to see enormous valleys, jagged lave cliffs, beaches and marine caves. On a very clear day, you may be lucky enough to see Mount Teide, which is the highest peak of Spain and located on the neighbouring Island of Tenerife. Snacks are available and included in the trip. As we sail towards the coast of Puerto de Mogan, we pass some of the typically popular tourist destinations on the South West of Gran Canaria. Stunning Playa de Amadores is seen on many of the postcards in Gran Canaria and is famous for its turquoise coved sea and white sands. We then sail past Playa De Tauro, Playa Del Cura, Playa De Taurito (famous for its waterpark) and then passing Playa De Mogan, famous for its beauty of the resort Puerto De Mogan. As we pass Playa De Venegueras, you will see thw weonderful valley that sits perfectly behind it, making a lovely picture. After Playa de Tasartico, we arrive at the most remote beach in the area…GuiGui. If the weather and the tide allows us to, we cruise on to the furthest point of our trip, Punta del Descojonado. We then begin a gentle cruise back towards Puerto Rico and during this time, you can enjoy the wonderful buffet lunch, freshly prepared for you. This includes Tropical Salad, Tuna Salad, Marinated Chicken, Steak with Sauce and potatoes. After food, it is time to relax on your sun lounger with a full stomach and a drink of your choice and enjoy the Canarian Sun, as we cruise along. For the final stop, we drop anchor near to the coast line and this is your chance to cool off and have a swim in the sea, or if you feel more adventurous, why not hire a Jet Ski? For those who wish to try the Watersports, you will receive a big discount to the beach prices, as an added bonus of the trip. After an amazing day, we then return to Puerto Rico Harbour and you are returned by coach transfer to your resort.